In many societies of Central Africa, such as the Chokwe and related peoples like the Songo and the Ovimbundu, functional artefacts are transformed into prestige objects that commemorate the power and status of the chief. 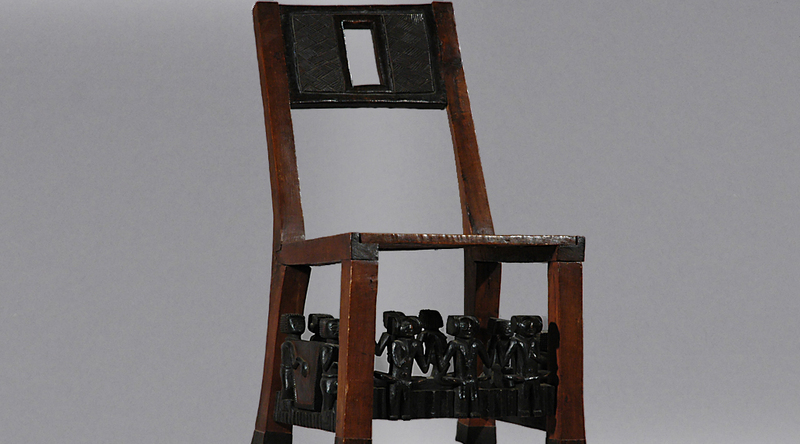 Chokwe chiefs possess many elaborately carved articles, including ceremonial weapons, staffs of office, tobacco pipes, and seats of office like this example in CHRISTA’S collection. Over the course of numerous encounters with European traders as early as the seventeenth century, Chokwe chiefs appropriated the design of certain types of Western artefacts. 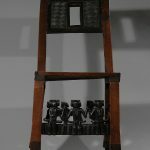 The seats of office, or “thrones,” of Chokwe chiefs, with backs, leather-covered seats, and decorative brass tacks, are modelled upon European chairs. 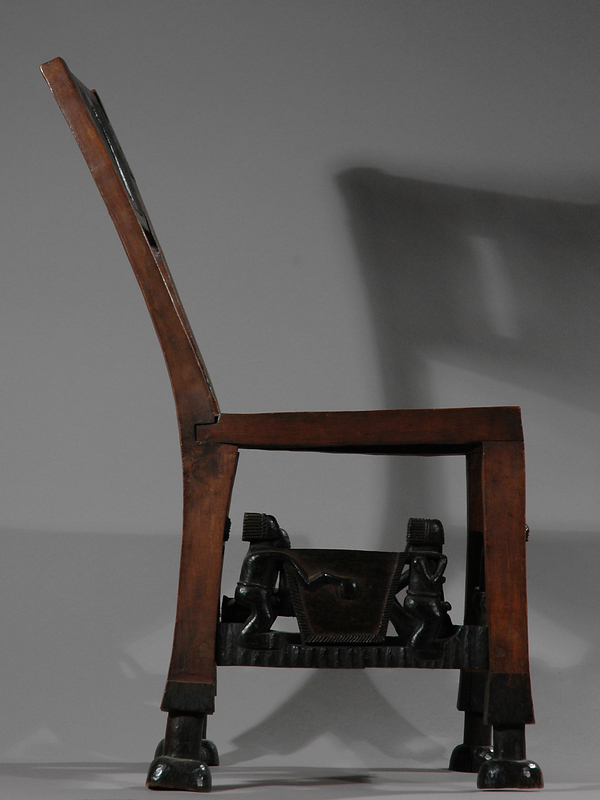 The decoration of the chair, however, remains distinctly Chokwe in style. 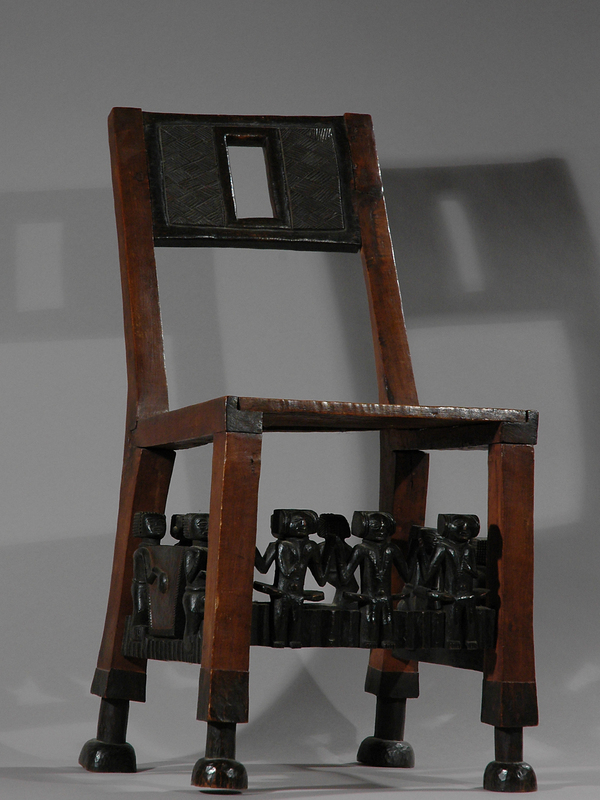 The elaborate figurative scenes depicted on this and other seats of office are designed as symbolic small-scale version of life and represent the breadth of a leader’s concerns and responsibilities. The back uprights contain scenes from the spiritual aspect of life, including depictions of ancestors or chiefs. 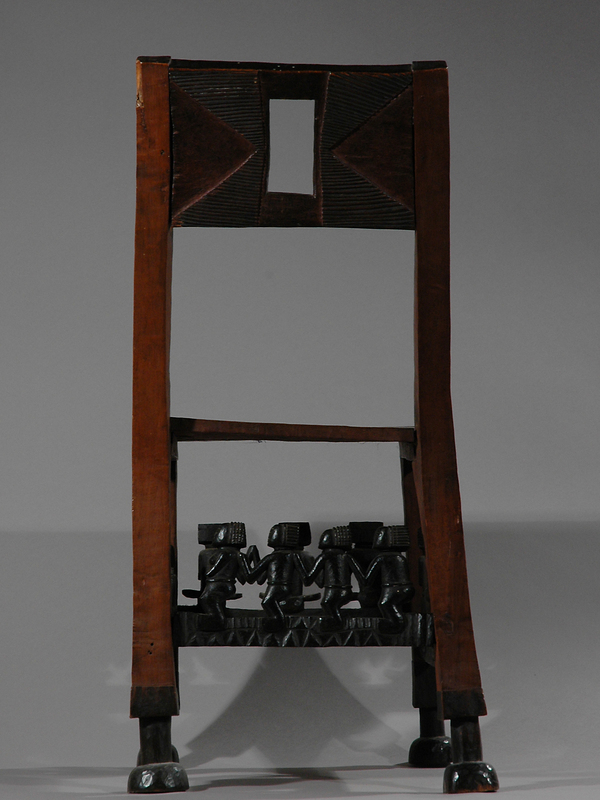 The dance figures along the bottom and the masked figures along the second rung refer to Chokwe initiation rites. The conical masks, known as cikunza, promote fertility and are used during the circumcision rituals of Chokwe adolescents. The topmost rung features two ngungu birds. The ngungu bird is the largest bird known to the Chokwe and is associated with hunting—a vocation with which Chokwe leaders closely identify. It is also a good omen, a sign of success in the hunt and therefore a sign of power. 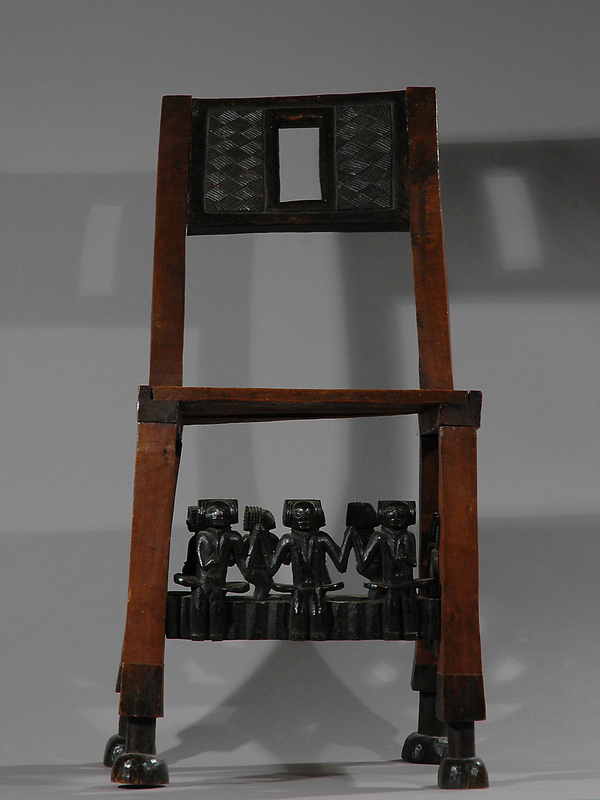 In addition, the ngungu serves as a mediator between the spiritual and earthly realms and is often displayed with other symbols of chiefly power. 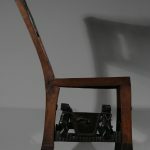 The rows of figures along the stretchers at the base of the chair are carved representations of scenes from everyday life. Images of hunting or trading are common, as illustrated on the front and back rungs, which feature men tending to cattle. In this piece, domestic activities like food preparation are depicted on the side rungs. The proper left rung features women tending to their children and pounding grain, while the proper right rung depicts men at work. 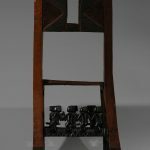 These quotidian scenes are universally identifiable to the king’s constituency and serve as a juxtaposition to the ritual events depicted at the summit of the chair. The overall organization of these scenes creates a united visual narrative emphasizing the social harmony and continuity that is ultimately achieved through following the enlightened leadership of the chair’s owner, namely, the chief. The Chokwe kingdom rose to power during the late nineteenth century in the broad expanse of open savanna in the southern region of the Democratic Republic of Congo and northern Angola. As the Chokwe population expanded, they eventually conquered the previously dominant Lunda empire, which declined after the abolition of the slave trade in the 1830s. The Chokwe peoples thrived primarily because of the profitable trade of ivory, wax, and rubber with the Portuguese. 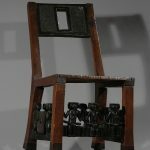 Chokwe chairs are among the few African objects not carved from a single piece of wood but are instead assembled in parts.